Prince.today | Play Prince.today free on iogames.space! 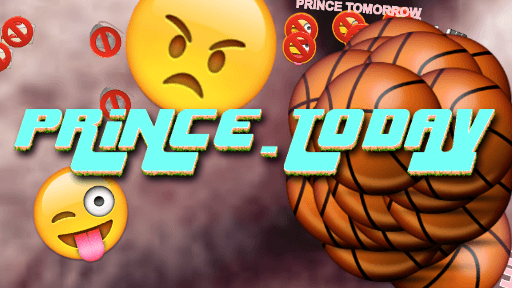 - In prince.today you can blow your emoji up, taking down others in the process. Of course, everyone else in there can do the same, so good luck! - Move around using your mouse. - Eat dead players to become bigger and faster. - To blow up yourself up, click and hold until you explode. - While blowing up you are immune to other players' explosions, but you're stuck. - Exploding yourself makes you spin out of control for a short period of time (during which you cannot explode again). - Exploding yourself WILL NOT kill you, and WILL NOT reset your score. - Eating earns you score for the leaderboard. - The bigger you are, the faster you become and the more particles you explode into, thus improving your chances of taking other players down. - Eat enough so that you acquire a decent size and speed but don't get too greedy, otherwise it becomes really easy to run into an explosion and die unexpectedly. - If you become too big and fast for your own taste, just explode to get back to initial size and speed. - Since you are immune while blowing up, defend yourself by clicking and holding just enough to not actually explode - as you release you will regain control and deflate back into your size, having averted certain demise. - When players explode they will temporarily spin out of control - take advantage of this and try to take them down while they are at their most vulnerable.